Dear Terrorists - I'm Coming! 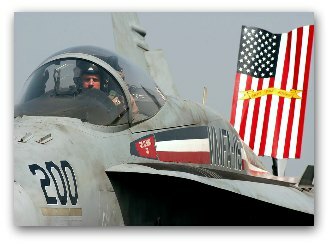 I am a US Naval Aviator. I was born and raised in a small town in New England. I come from a family of five. I was raised in a middle class home and taught my values by my mother and father. My dad worked a series of jobs in finance and my mom took care of us kids. We were not an overly religious family but attended church most Sundays. It was a nice small Episcopal Church. I have a brother and sister and I am the youngest in my family. I was the first in many generations to attend college. I have flown Navy aircraft for 16 years. For me the flying was never a lifelong dream or a "calling," it just happened. I needed a job and I liked the challenge. I continue to do it today because I feel it is important to give back to a nation which has given so much to me. I do it because, although I will never be rich, my family will be comfortable. I respect my elders and always use "sir" or "ma'am" when addressing a stranger. I'm not sure about kids these days but I think that's normal for every generation. I tell you all this because when I come for you, I want you to know me. I won't be hiding behind a woman or a child. I won't be disguised or pretending to be something I am not. I will be in a US issue flight suit. I will be wearing standard US issue flight gear, and I will be flying a navy aircraft clearly marked as a US warplane. I want you to know also that I am very good at what I do. I can put a 2,000 lb. weapon through a window from 10,000 feet up. I generally only fly at night, so you may want to start sleeping during the day. I am not eager to die for my country but I am willing to sacrifice my life to protect it from animals like you. I hope you know me a little bit better now. See you soon. . . sleep tight! The Marines of Baker Company want to let you know, We Remember. USS New York (LPD-21), built with scrap steel from the Twin Towers. Return to top of Dear Terrorists.